Thank you to those who “liked” my new etsy shop on Facebook. With my one product. Most of my stockings are sold because of word of mouth. It’s that time of year again. 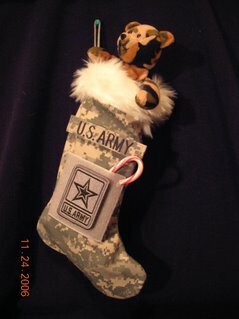 People start doing searches for “Army Christmas stocking” or” ACU Christmas stocking” and my post from 2006 comes up, eventually. And people send me emails asking if I’m still making them. Yes. As a matter of fact, I am. And I took some newer photos, which I will now post. I have two sizes. The smaller ones are about 6″ x 11.5″ and the larger ones are about 7″ x 13″. The small ones are an old style, but the fabric was already cut out. When it’s gone, it’s gone. They are $15 each. The larger ones are $23 each if you contact me via email. They are more via etsy. It’s the cost of business. The loop is 550 cord. The loop will hold 550 lbs. My stitches will not. I do quadruple stitch the loop in place, but I wouldn’t bet on the tensile strength. The 550 cord is a cool touch. 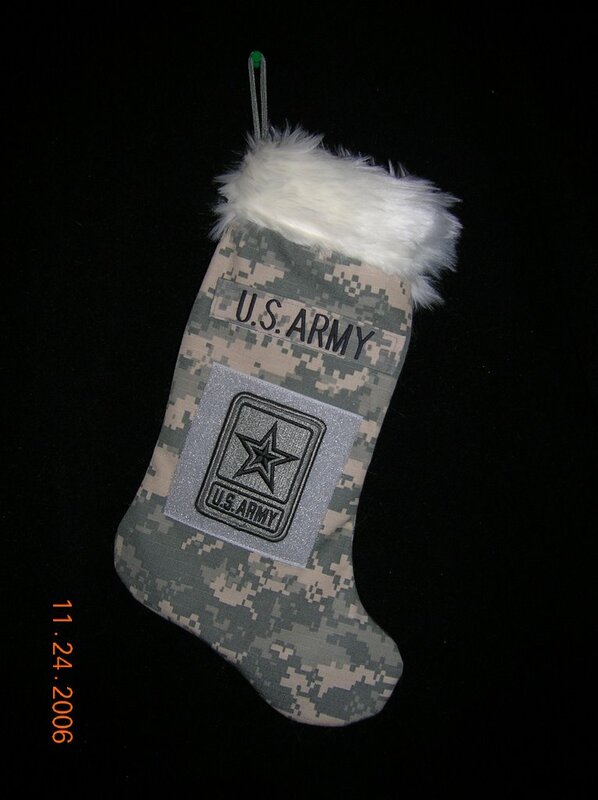 You won’t find other ACU Army Christmas stockings with 550 cord loops. Just mine. I do think the quadruple stitching will hold most stockings stuffers, though. I can make the stockings hang to the right or to the left, although the small ones are already stitched, so you have to accept my limited supplies. I’m stitching the larger ones this month, and I do not think I will order more fabric this season, so if you have a strong preference, order soon or pray that I have want you want. 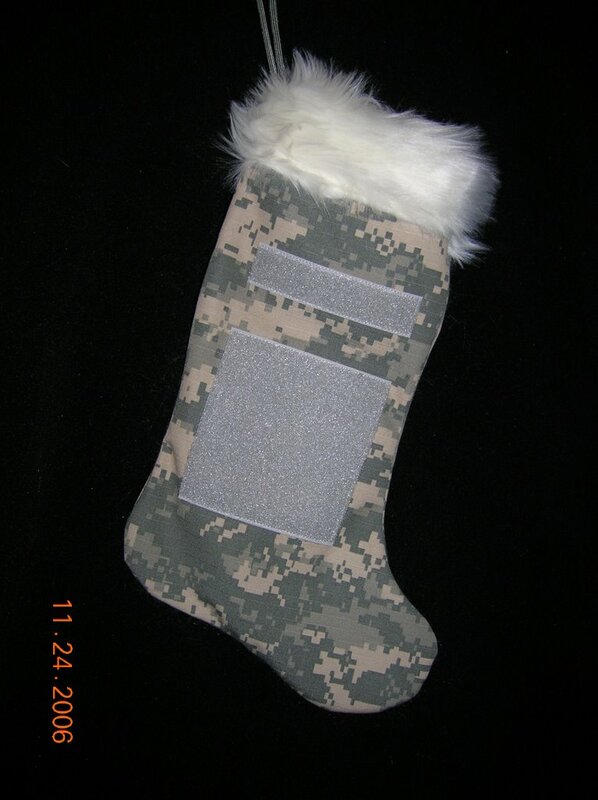 There are two pieces of velcro on the stockings. One is perfect for the name tape and the other is the right size for unit patches. 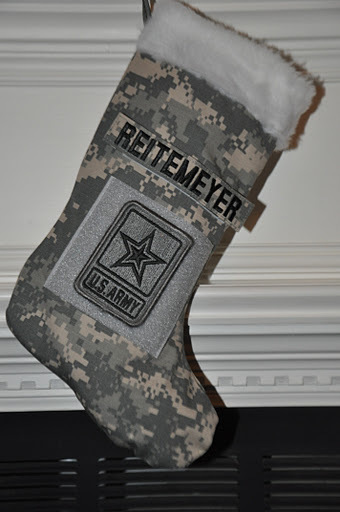 I do not include name tapes and patches, unless you want REITEMEYER on your stocking. If you are sending this to a soldier overseas and do not have access to name tapes and unit patches, don’t fret. 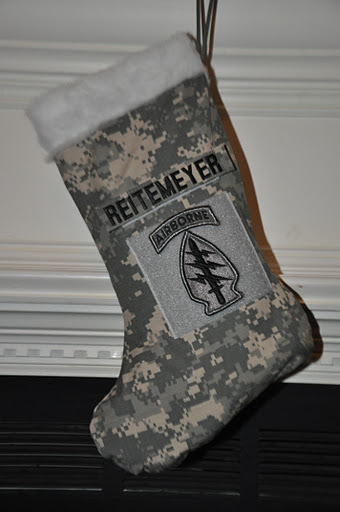 Soldiers usually have extras, or they go and get their name in Pashtu to decorate their Army Christmas stocking. Leave a comment or email me if you are interested. Because the colors of Christmas are the greens and tans of camouflage…right? My dining room table is my work space. I’ve made the mistake of wearing a black shirt while working. I can hang ’em right or left. And once again, I am pondering the wisdom of having a seasonal business that is busiest at the busiest time of year. And once again, I am vowing to spend my summer sewing. Folks, you just won’t see this everywhere. This here is a real live action shot of one of my homemade Army ACU Christmas stockings being used as decoration in Afghanistan. No fooling. That there is a real Army issue cheap-o press board wardrobe in a real Army barracks somewhere that routinely gets mortared, but I’m not to worry about that because very rarely does anybody get hurt. Right. 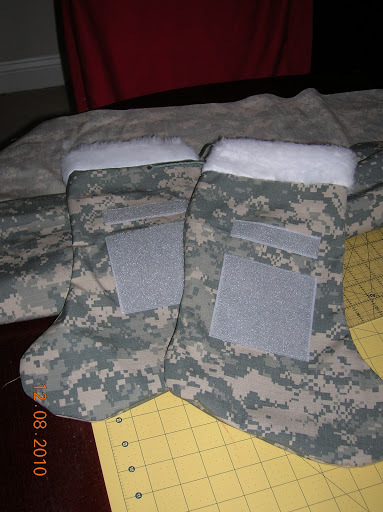 I have already sold one of these high-speed stockings and have a limited supply available for anyone with a loved one serving in the Army (sorry, other branches do not use this pattern and may take offense if you give them an Army uniform stocking). 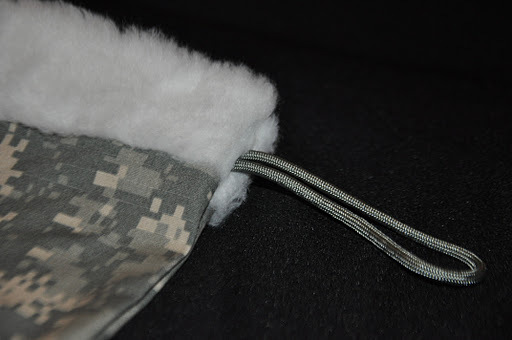 The fabric is a rip-stop ACU pattern, just like the current Army uniform, and the loop for hanging is made from matching 550 (parachute) cord. 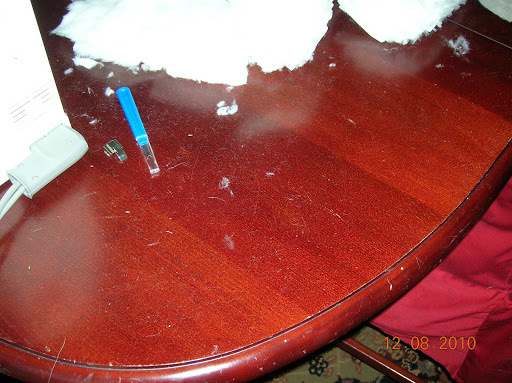 White fluff at the top adds just the right Christmas spirit (current stock has white felt – same effect). 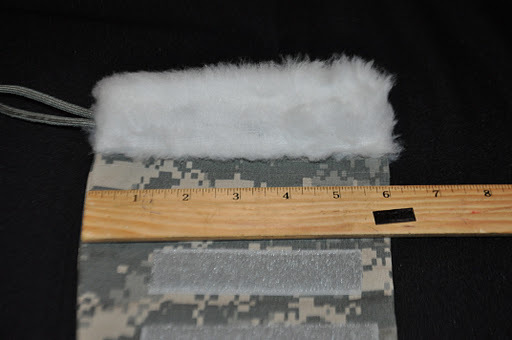 There are two pieces of gray Velcro on the stocking: one is large enough to hold the standard Army name tape, and the other is perfect for a unit patch. The patches shown here (not included) show “Reitemeyer” written in Dari (remember to read right to left) and the Afghani “Commando” unit patch. The Afghani Commandos are Afghani, not American, and yet “Commando” is written in English, not Dari. 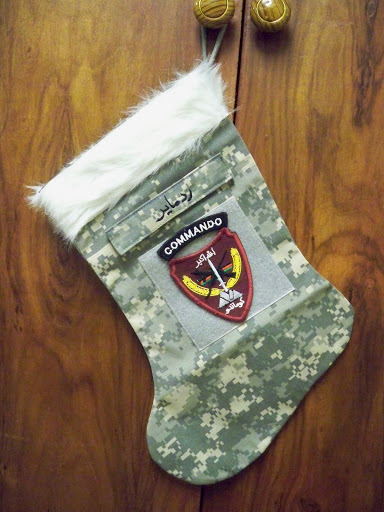 This is further proof that the stocking is in a real live action shot because other photos I have show official name tapes and official patches not the fun things soldiers pick up while on duty in foreign lands. 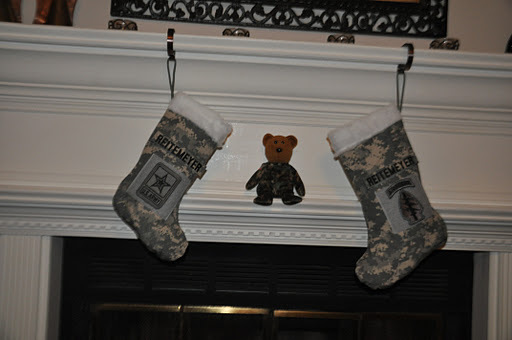 These stockings make the perfect gift for a deployed soldier. They are generously sized to fit the usual stocking stuffers. 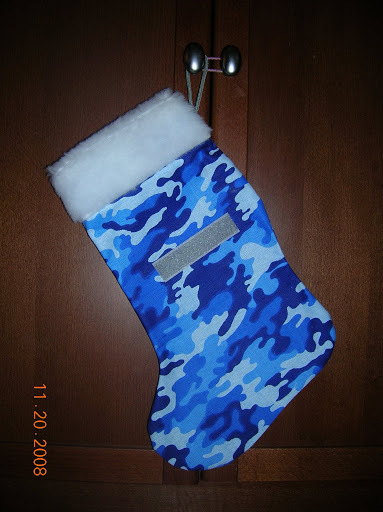 They also make a great office decoration for those soldiers on domestic duties who have offices or cubicles or lockers. I guarantee admiring and jealous comments from fellow soldiers. And if you like to give a bottle of wine/champagne as a Christmas/New Year’s gift to your favorite soldier, I just tested a stocking with a bottle of Liebfraumilch and it makes a perfect gift cover. 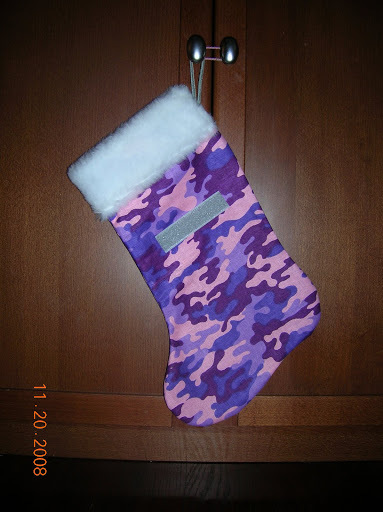 The stockings are $20 each plus $5 S&H for up to two stockings. Email me if you are interested. I accept Paypal. I will try my best to get them mailed quickly. All proceeds will directly benefit the family of a deployed soldier (that would be mine). It’s that time of year again. People are googling “Army Stockings” and “ACU Stockings,” and my blog comes up near the top of the search. This is pretty much what they look like (patches, teddy bear and candy cane not included). 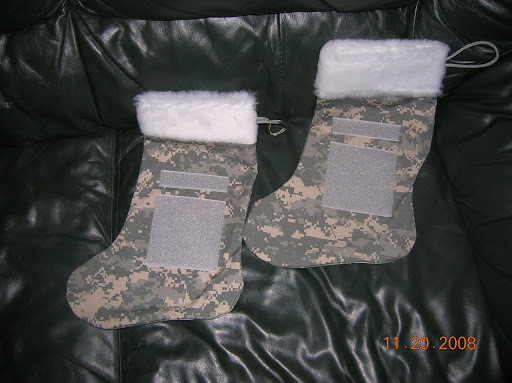 I do hope to post some new pictures soon (I think the new ones are bigger), but wanted to get this post up for those women out there looking to send something to their deployed sweethearts (who else would be looking in October for Christmas stockings?). Price: $20 each plus S&H. I have to see how many will fit in a box before I calculate postage. I will take Paypal from anyone or a personal check from someone I know. Email me (link on the top right under my header) if you are interested. Updated link with S&H cost and newer photo. Barb, if it’s not there by Saturday at 3 PM, then shipping is free. Apparently, I have too much free time. And I have too much remnant fabric. I’m working on a bunch of these to go to my sister’s husband and his troop in Iraq. No, I’m not taking orders for any others. I really don’t think I can do them this year, mainly because I offered to give any extras I make to my sister’s FRG to use as a fundraiser. 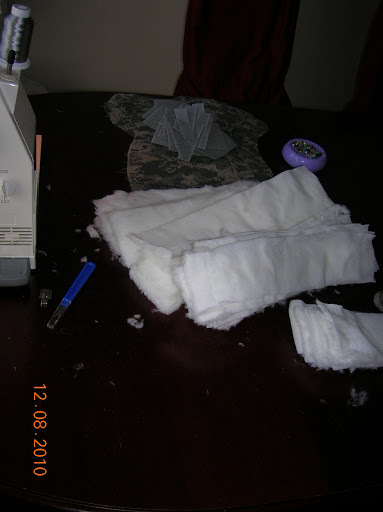 I want to use the remnant fabric to make some cute little stocking ornaments. Here is my prototype. I thought I would use a glitter gel pen to write “2008” on the cuff. So, what do you think I should sell them for? Originally, I had thought $5. Now, looking at it, I think $3. If you saw them at a little kiosk and thought, “Hey, that’s cute. I’d love to hang that on my tree. I wonder how much it is,” what price would make you consider it, and at what point do you walk away? 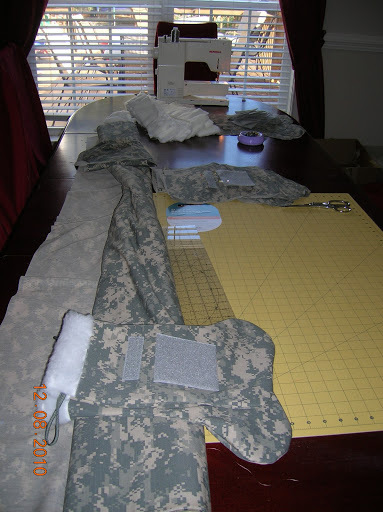 And, you military wives out there, any suggestions for making it fancier? I could cut out tiny little velcro patches, but that would be tedious and nothing would fit on there anyway. A soldier could always pin his rank on there. Well, up to a one-star could. Two stars would be too big. 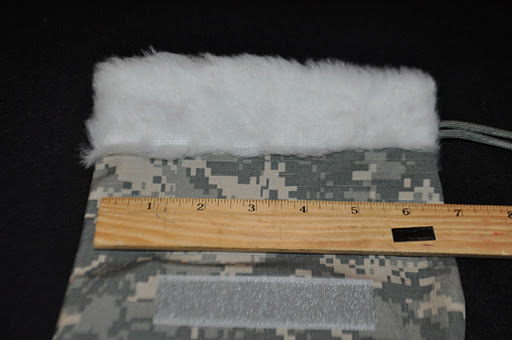 This is what it looks like with the US ARMY tape on the top velcro and a unit patch on the bottom velcro. Those are not included. This is what it looks like with “stuff” in it. The “stuff” is not included. Email me (on sidebar) if you want one. Lead times depend on how well my kids behave over the next week. All proceeds will go directly to a worthy military family (mine). Angoraknitter and Jennie can claim free ones for their hubbies because they regularly leave such nice comments on my blog (email me your address, ok? ).